Take the $7 Angels Express train to any 7 p.m. weeknight home game! Take the $7 Angels Express to Any 7 p.m. Weeknight Home Game! 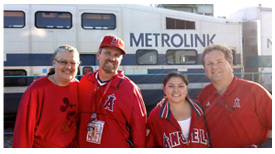 Last season, the Angels Express provided service to 46 home games, and had more than 20,000 boardings. This popular service has returned for the 2012/2013 baseball season, with service along the Orange County Line to 50 home games. There will be service from the Inland Empire for all 13 Friday night home games. Trains will hold after Friday night games, allowing riders to enjoy the Big Bang Fireworks.